A slow burning novel about the end of the world. I didn’t think I was going to like this book. I thought it was going to be slow and dull, just another book about the end of the world, and not an exciting one at that. Then I remembered I was reading it for book club, the book club I have been a member of for 2 years, that same book club that only reads post-apocalyptic and dystopian novels. I love my book club for a few very good reasons, but somewhere in the deluge of fantasy I have read this year I had lost my way and forgotten my reasons. Firstly, novels about the very worst of humanity’s potential are sometimes also the ones that help us see clearly what is best about our deeply flawed existence, and secondly, books about possible futures are most often commentaries on our very real present. None of this seems like it’s a book review? Well let’s get back on track. 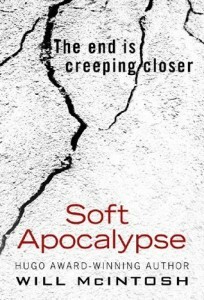 Soft Apocalypse is a novel set during the slow decline of North America in the near future. The setting is urban America, unwilling or unable to accept that it is doomed, that already somewhere a line has been crossed between ‘possibility of a future’ and ‘beginning of the end’. It is a world already well on the way towards the end of humanity’s reign on earth. The story follows Jasper, a rather generic representation of white middle-class America, and his ‘tribe’ of friends thrown together by circumstance. They are initially homeless, travelling together and trying to make ends meet in a country slowly falling apart, and move in and out of each other’s lives over the 15 or so years the novel spans. One of the best things about this novel are the side characters. Each of the members of Jasper’s tribe (of which he is not the leader, though his is our protagonist) are well fleshed out and feel like real people, each representing different struggles in a dying world and different ways people grow-up and into their own skin. There is also a series of Jasper’s lovers who reappear throughout and are all complex characters with their own stories. It often felt like the story could have been told from the perspective of any one of them and it would have been totally different but equally engaging. Indeed I often hoped for a perspective shift at the end of a chapter just to have a break from Jasper’s head, but by the end of the novel the rhythm had swept me up and I was glad for the single perspective. I have read a lot of novels about the apocalypse, with a kind of morbid fascination and curiosity. Occasionally they really get under my skin and make me think. 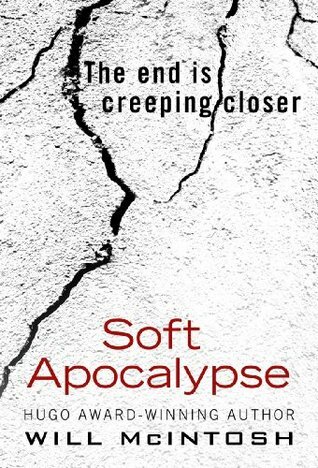 Soft Apocalypse was one of those. It has issues with pacing, the main character is for the most part pretty pedestrian, and his obsession with getting a girlfriend grated, but I think as a character he played his part well as a story-telling tool. It takes about three quarters of the novel for Jasper to accept what readers have known from the first page, that this is a book about the apocalypse. Sure, it is a slow decline, not a single massive catastrophe, but it’s not going to get any better. For me this was the key to the appeal of this story, the wake-up call that humanity is the frog in the slowly heating pot. While I can’t say that this is my favourite novel in this sub-genre, it is an interesting addition. Though I enjoyed it, and the way it has made me think more deeply about some things, it is not a novel I will go out of my way to recommend to others.